As we are nearing the end of this holy month, Ramadan routine has finally kicked in for many of us that may take a little while longer than others to get used to the late night eating and super early morning coffee drinking. Having said that, some of us may not have been able to embark on this journey fully – or may be falling out of the routine. You’re on your period, and all you can think about are the days of fasting and taraweeh (late night prayers) that you’re missing out on. Eight years ago, we wrote a feature on earning the blessings of Ramadan during menses. You can read the article here. While the feature linked above covers the practical aspects of earning the blessings of Allah SWT during Ramadan while on menses, this is really only half of the adventure. 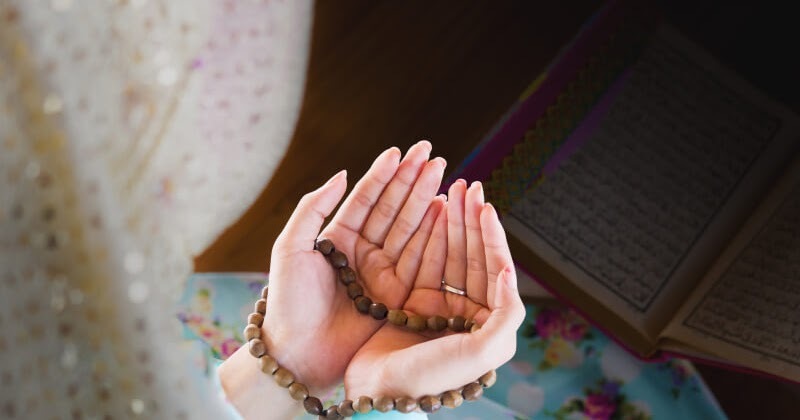 This time around, we are further expanding on this topic — on how you can make the best of your Ramadan during your period — by focusing on active thinking and awareness of observing the Holy month. Yes, there is a big focus on fasting and praying in Ramadan, but ultimately we need to focus on the purpose of Ramadan. What does Ramadan mean to us? Allah prescribed Ramadan to us to help us develop and strengthen our self-control, so that we will be equipped to resist wrong deeds. By restricting our food and behavior through fasting, we are limiting many worldly desires. In this way, we are strengthening our self-control, restructuring our patterns, and reenforcing our ability to progress through the rest of the year as Muslims. The purpose is also to gain nearness to Allah. We all know that our imaan (faith) fluctuates up and down. Some days we may feel more in-tune with God than other days. This is part of our nature. But Ramadan gives us a chance to channel our focus towards Allah even more so than other times of the year. Let’s not forget the extra focus we have on charity during Ramadan; opportunities for zakat (alms-giving) are all over. While hormones run through the roof, being on our periods does not mean our observation of Ramadan goes on hold. Not being able to fast does not mean that we stop our Ramadan worship. Refining your intentions in your daily routine is crucial. Ramadan is the perfect time to beat our own ego which may escalate during this time. Remembering that we live for the sake of worshipping Allah, and to sincerely conduct our daily lives with this as a core progressing factor, will be a way to regain sincerity towards ourselves and those around us. Ikhlas and arrogance of the ego cannot coexist. Providing your energy to prepare iftaar (meal to break the fast) for those who are fasting is an act loved by Allah SWT, so much so that you will gain the reward equal to the one who is fasting. Ikhlas can materialise in every aspect of our lives: Look deeper into your job, into your relationships, into your prayers. Are you waking up for the sake of affirmation of your senior boss or is it for the sake of Allah, to provide for yourself so you may fulfill the responsibility that Allah bestowed on you? Do you love your friend because of what she can do for you, or do you accept her flaws and love her for the sake of Allah because you acknowledge that her companionship is a gift from Allah? Do you pray because your social circle would judge you otherwise, or do you do it solely because you submit and acknowledge your powerlessness in front of Allah? These are all daily experiences that we need to be more mindful and thoughtful in reevaluation. Using your time during your menses to reconsider and ponder on your intention and what’s driving your actions in life can be a life-changer. It will help you accept challenges ahead, and what a better time to refine your intentions than when you have the energy and the spirit of Ramadan around you?! This surely is a gift to women from Allah. As suggested in our previous feature, you should spend your time in remembrance of Allah with dhikr (remembrance) and making dua’a (supplications). Engaging with the Qur’an daily is a golden key to progress, regardless of where you are on your ladder of learning. Recite and understand. If you can’t, memorization through audio helps. If you can’t do that, just focus on listening actively. All these actions will help you ponder and reflect on your life and daily routine. While we are not perfect, the time that we have to be less occupied with tiredness is the perfect time to look into our intentions.